The line between dessert and breakfast food for me is a bit blurry. So blurry that for the week after my bat mitzvah I ate cake every morning for breakfast (marble cake with raspberry filling and butter cream frosting, in case you were wondering). This spice bread also blurs that line. Part dessert and part breakfast food, you can enjoy it any time you want. For me, I’ve been enjoying this with my morning coffee this week. A few quick notes about the recipe before we dig in: If you have a mixer and want to use it, go for it. You will only need it though to cream the butter, sugar and eggs. So feel free to spare yourself the clean up and just go for a wooden spoon or spatula. This recipe also calls for sifting flour. If you don’t own a sifter don’t sweat it. Just be sure to add the flour slowly to the batter. 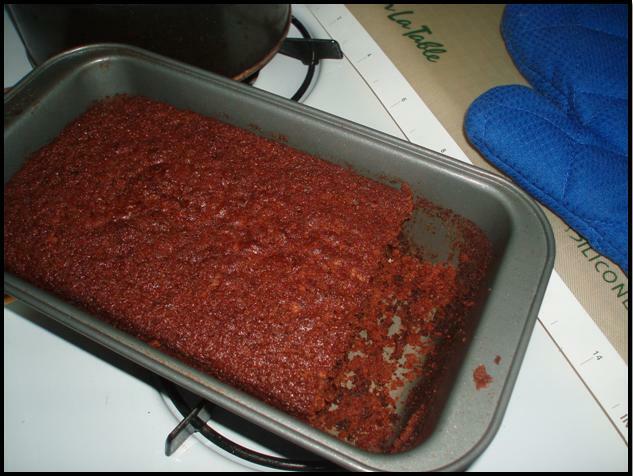 Grease a 8” x 3½” x 4” loaf pan with butter or cooking spray (I recommend butter). In a large bowl stir together the butter and sugar. Mix until creamy. Measure out the flour and place in the sifter. Take 2 tablespoons of flour from the sifter and add to the bowl with the butter and sugar and mix. Beat the eggs in a small bowl with a fork until foamy and add to the large bowl. Mix together with butter and sugar mixture until a fluffy mixture forms. Add to the sifter the baking soda, cocoa powder, cinnamon, allspice, and nutmeg. Stir in the sifted flour alternating with the sour cream or yogurt and the applesauce. I like to break everything into thirds. I add a third of the flour, stir, a third of the yogurt, stir, and then a third of the applesauce, and stir. I repeat this until I’ve mixed everything together. Pour batter into the loaf pan and bake for about 1 hour or until the center springs. Let the bread cool before serving.